The burgermen at The Golden State had nothing but positive things to say about Bradley Ogden at Caesars Palace, and Alan Richman of GQ pronounced the Bradley Ogden burger to be Burger of the Year in 2010. Keep in mind that the same publication gave the same award to Le Tub once, and that burger was a disaster. Nonetheless, I walked (ran—I was very close to being late, and Caesars Palace was HUGE) into Bradley Ogden looking forward to a magnificent cheeseburger. I spoke briefly with Manager, Bradley Bitterman. He was terrific and most accommodating. 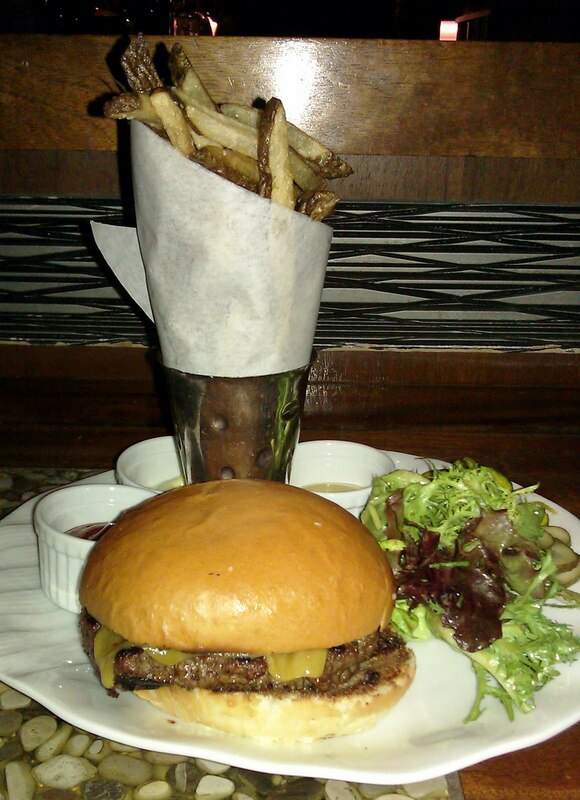 I went with the House Ground Steak Burger and Fries for $19. The burger came with a small side salad. My server informed me that the burger was variable in terms of the cuts used in the blend, and that this depended upon what scraps the kitchen had available that day. She told me that my burger would be composed of Filet Mignon, Ribeye, and Waygu. This was not true, the Chef informed me later that the blend was Chuck and Ribeye trimmings. I did not learn this until it was too late, and I ordered my burger Med-Rare. About 15 minutes later, my cheeseburger arrived. The Beef: The wet-aged beef from was ground in-house, so it was noticeably fresh. It had a mild funk of aging, and it was moderately beefy. The Chuck-heavy blend was not cooked hard enough to melt the flavorful collagen, so the minority % of the blend (Ribeye) was tasked with carrying the flavor of the dish. The server informed me that the fat % was 30-35—that meant that this should have been a “butter burger.” It certainly did not seem that oily. Frankly, this was a pornographically juicy burger. I think she was delivering a lot of bad information…probably not her fault. The juicy beef was modest in flavor but strong in firm texture. The exception was the satisfying taste of iron. This carried throughout the bite, and coupled with the firm, coarse bite and char, this burger was strongly reminiscent of a Porterhouse cooked on a backyard barbecue grill. The Seasoning: The beef blend was not seasoned, and the burger patties at Bradley Ogden were dusted quite lightly with something salty. The seasoning could have easily been doubled with jeopardizing the flavor of the beef. The Sear: The burger was grilled over ridiculously hot oak coals. As a result the fatty burger got more of a char than a sear. The char was thin and crisp in places with plenty of carbon. The scattered crunch held up against the copious juices of the burger. This worked for the most part, because it held to the backyard barbecue flavor profile. The times when this didn’t work were when the char on the bun coupled with the char on the burger. Then it was a little too strong. The high heat cooked the burger very quickly, and as a result the sear/cooked layer of the beef was quite thin. The top of the burger got a better treatment than the bottom--the photo of the bottom of the burger is not indicative of the flavors, only the quality. The Preparation: This was a formed-to-order, coarsely ground (in-house), 7 ounce patty of loosely packed beef. 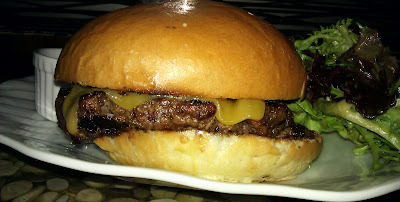 The preparation at Bradley Ogden created a very satisfying mouth feel, and a wonderfully juicy burger. The burger was cooked over such an intense heat that it was not so much Med-Rare, but a well-warmed collection or bloody rare beef encased in a seared/charred pouch. The coarse texture carried this off pretty well. Additionally, the burger was brushed in a red wine butter to infuse it with some additional flavor. The Bun: The bun was a house-baked burger bun. It was yeasty and savory, and to further boost those flavors, the bun was brushed with a mustard butter before toasting. The bun was just chewy and resilient enough to contain the burger juices, but it was still toothsome enough not to compress the beef when bitten. The bottom bun, when saturated with beef juices, was a delight. The top bun was charred on the grill rather than simply toasted. Since, I cut the burger in half to eat it, I noticed that some bites had more char than others. I removed the top bun to discover parallel lines of char, which were causing that issue. The Fries: The fries were a solid PASS. They were dark but not crisp, and they were rubbery. The chef did admit that the fries were a consistency challenge, and he further noted that the supplied delivered the potatoes cold. If the supplier held the potatoes in refrigerated storage, then that would have explained the issue. Cold potatoes convert starch to sugars, and sugars caramelize when cooking. Sugary potatoes would brown too rapidly to cook through and yield a rubbery fry. The fries were cooked in canola oil and finished with pepper and sea salt. The Toppings: No lettuce and tomato….good. The burger came with two types of house-made, thinly-sliced, absolutely fantastic, flavorful pickles. These were based on a recipe of the previous chef’s grandmother. Madame—we salute you. The Value: The value was mediocre considering the rubbery fries and the fact that this was a wet-aged Chuck burger. I had the privilege of speaking with Chef Michael Gill and discussing the burger with him. Chef Gill was highly knowledgeable and personable. I imagine that burgers were not the chef's strong suit and that there was more to the award-winning Bradley Ogden than the burger. Sadly, my server misinformed me as to the components of the burger blend, so the Rare cooking temperature did not bring out the flavors of the actual cuts of beef. I later learned that this was not the same team at Bradley Ogden that had previously received all of the high marks. Chef Ogden was no longer involved--his son was in charge. Also, the previous chef had moved on. So it goes. Burger Review : A juicy exemplar of a high-quality backyard char burger was showcased at Bradley Ogden. Rating…3 Bites 4 reduced to 3 due to the charred beef and bun.